Answering Objections To A Post-Tribulation (Second Coming) Catching Away! PART I – Let's Get It Right! Recently I received a comment to an article on my blog page that raised numerous objections to the notion of a ‘post-trib’ catching away of the Church. As it would have taken a response of such length to fully address the issues he raised that it would have been inappropriate for the comment section I have chosen to give a reply to his objections here. One thing I have clearly noticed over the years is that most objections to post-trib teaching are normally couched in a ‘this is what I (a pre-trib view holder) believe, and what you are saying is not in agreement with what I believe, so you are wrong!’ mindset, rather than a ‘Hey Paul, this is what the Bible plainly states; and you are speaking contrary to that clearly expressed Bible truth’ response. Though they certainly use many proof texts (mainly snippets out of context or verses they twist to say what they want), to them their doctrine is the standard of truth rather than the expressly stated truths of the Scriptures. Coming to the Scriptures with presupposed ideas it is quite easy to read those ideas into various verses that in themselves do not actually bring forth your notions. Thus someone convinced of a false doctrine routinely sees that doctrine in the pages of the Bible even though the Bible teaches no such thing! The first thing we must consider here is the context in which that exhortation to ‘pray we would escape all these things’ is found. Jesus had just finished the Parable of the Fig Tree in which he gave us certain things to WATCH for which will indicate the season (the season not the day or hour) of his Return. He said to WATCH because there are things we are to stay alert for or we will not SEE them. He then goes on to tell us: WATCH YE THEREFOR and pray always… (verse above). Why would he give the Parable of the Fig Tree to teach us what to watch for; and then exhort us to ‘watch ye therefor and pray’ if that exhortation (v36) was actually him giving us a promise we would leave this world BEFORE all these things we are told to be watching for could even happen? To state Luke 21:36 is a promise of a pre-trib rapture not only defies the very context in which those words are found but also common sense itself. The way Luke 21:36 is given as a proof text of a rapture/departure before the tribulation is clear evidence of the way that theory is deceptively inserted into verses that of themselves bring forth no such understanding if examined in their contextual setting. We see the exact same treatment of many other portions of Scripture (such as Revelation 3:10) that actually DO NOT make the promise they claim! FOOD4THOUGHT: Remarkably those who preach and teach the pre-trib error are quite bold about claiming that what is referred to as the Olivet Discourse is not for the Church but only for the Jews! They claim we are not to see the prophecies and exhortations of Matthew 24, Mark 13, and Luke 17+21 as applying to the Church but only Israel. Yet they (contrary to their own theology!) make no bones about pulling promises like Luke 21:36 above, or stealing snippets such as ‘no man knows the day or hour’ or ‘one taken and another left’, from those very chapters they claim are off-limits to Church theology, and then applying them to their pre-trib rapture! Why people cannot see the outrageous hypocrisy of this treatment of the text is beyond me! MORE FOOD4THOUGHT: In the event of a (supposed) pre-trib rapture what would become of the promises of God’s Word during the time of tribulation? Would his promises no longer be valid. Could you read your Bible and believe it; or would his Word no longer be true? According to pre-trib theory the faithful would no longer have a promise to ‘escape those things’; and the believers of that day would now be appointed to wrath (since they insist on claiming the tribulation is God’s wrath – which it is not!). Should we believe the living Word of God has an expiration date? Now we must ask ourselves: In the light of the whole counsel of the Word of God, is a promise to ‘escape’ troubles and tribulation to be seen as a promise to *leave planet Earth as those events manifest? *Could someone please show me in the Scriptures ANY reference to the Body of Christ departing and leaving planet Earth at the catching away of the Saints? There is not one place this notion is presented! NOT ONE! The idea of the Church being transported off the Heaven at any rapture (pre-trib or otherwise) is a man made myth. The Bible teaches no such thing! We will be caught up to meet Jesus when he comes back to Earth at the Second Coming. He is here to stay; and we will certainly ‘be with him where he is’ – just as he promised (John 14:1-3)! And we must ask: Is there any evidence of God’s people ‘escaping’ tribulations, trouble, and even great Judgment WITHOUT leaving this planet? And the answer is: Yes, absolutely there is! Through the pages of the Bible we find story after story of divine intervention on behalf of God’s people to preserve them through tribulation. Just look at the story of Lot for example. As the Judgment of God fell upon the wicked people of Sodom, Gomorrah, Admah and Zeboiim (actually the entire region of the Plain of Jordan) Lot was granted a divine ‘escape’ right in the midst of the destruction! Right smack in the center of the devastation he found refuge in the city of Zoar (one the five cities that had been targeted for destruction but spared because of Lot’s intercession). More on Lot’s escape from tribulation found HERE. So we plainly see that Luke 21:36 is NOT a promise of a pre-trib rapture! Again the pre-trib doctrine is being heralded as the standard of truth here instead of any scriptural foundation. Does the Bible distinguish those saved during the final few years before the Return of Christ as a separate entity from the Body of Christ? Nowhere is this concept promoted in the Word of God! In fact, the way that Dispensational/Pre-trib theory presents the salvation of their supposed ‘tribulation Saints’ is a dangerous journey into the soul-damning land of heresy! They erroneously teach what they refer to as ‘the Age of Grace’ comes to a close before the tribulation; and claim the ‘tribulation Saints’ are saved after that in a different manner than the Church (they supposedly save themselves through their martyrdom!). And they claim these tribulation Saints are NOT indwelt by the Spirit of God as the members of the Church are! But the true teachings of the Bible clearly tell us there is only one Way into the Kingdom of God; and that is to be born again! Even the Old Testament Saints had to enter the Kingdom through the regenerative power of the message of the Cross. That is why Christ went and preached to the departed Saints. There is NO OTHER WAY to be saved! It is only the Blood of Christ that has the power to atone for sin. 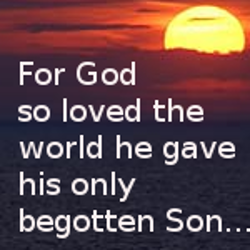 We cannot atone for our own sins by good works or the Cross was in vain! And to teach that during the tribulation, after a supposed close of the Age of Grace, that another way of salvation (self-sacrifice) is employed is absolutely heretical! The phrase ‘the time of Jacob’s Trouble’ comes from a passage in Jeremiah. Although the passage in Jeremiah is clearly written in the context of the captivity of God’s people in the days of Nebuchadnezzar we do see indication there is a dual fulfillment of these words that points to the end-time scenario. … in the latter days ye shall consider it. (Jer. 30:24). But the notion that the time of tribulation is ONLY for the chastisement of the nation of Israel, and claiming the Church is *will not face Antichrist, is a provable falsehood. The Bible does not bring to us any such understanding. It is true Israel will face great hardship during the reign of Antichrist; but God is dealing with humanity as a whole in the time of the great tribulation, not just one nation (Israel). *For twenty centuries the Church has expected to face Antichrist and his war on the Saints before the catching away of the Saints! Provable fact! It is only in recent times an opposing theory has come to the table. If the Theologians of the Church had expected a ‘rapture’ to whisk us away before the onslaught of Antichrist their writings down through the centuries would be absolutely chock full of teaching on such a notion. They are not. Just the opposite in fact. HERE is a page on my site that gives scores of quotes to prove that the Body of Christ has always expected to face Antichrist. The claims of quotes to the contrary are both quite sparse and deliberately misrepresented. Why are the writings of the fathers of the faith down through the centuries not replete with mention of a pre-trib rapture? Because they believed no such thing! If the time of tribulation (and the Olivet Discourse) was only for Israel why would Jesus end his discussion of these events with the words: And what I say unto you I say unto all, Watch. (Mark 13:37)? As I have stated many times, the time of tribulation is one giant ‘last call’ to humanity as a whole to repent and turn to God. We see firm indication throughout the Scriptures that the time of tribulation in the last days is NOT just for Israel, but for the entire world; and we also see clear evidence the Church is right here on Earth during that time. In fact, I show biblical proof the Church is NOT missing from Earth during the tribulation in THIS ARTICLE. How could stating the obvious truth that the Church is the Bride of Christ (who doesn’t believe that? ), and then quoting Paul’s exhortation to comfort one another with the understanding we will one day be resurrected and caught-up to meet Christ in the air, be considered any kind of proof of a pre-trib rapture? It would take a solid dose of pretzel logic to twist those two truths into any endorsement of a pre-trib timing! I know I have kicked this can down the road often in recent times but am compelled to kick it one more time (and probably not the last!). Even most pre-trib believing theologians will honestly admit (due to key phrases found therein) that the subject under discussion in this lengthy context (1Thess. 4:13 thru 5:11) is the Second Coming of Christ, and NOT an earlier event! Some of us need to take off our ‘rapture goggles’, and actually study the entire context being quoted from! Seriously folks! We would do well to notice the exhortation to ‘comfort’ mentioned by brother Bobby in verse 4:18 is repeated in this very same contextual framework (in verse 5:11) AFTER a point is emphasized that the day being discussed is the day sudden destruction will fall upon those who have been saying peace and safety! That day is not a pre-trib non-appearance! It is the Second Coming! This passage in which ‘comfort one another’ and ‘caught-up to meet the Lord’ are both nested is a clear-cut discussion of the day Christ returns to Earth to rule and reign. ANY usage of those quotes to promote pre-trib theory is deceptive! Let’s engage in an honest treatment of God’s Holy Word, and get that right, shall we? But this mindset of ‘you better believe in the pre-trib rapture, and not question it, or you’re getting left behind’ shows the complete lack of accord with the Word of God the pre-trib myth is founded upon. Come on people! 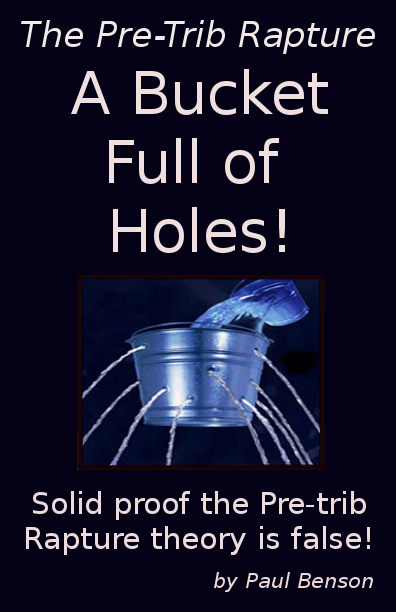 Believing in the pre-trib rapture does not make you eligible to take part in the resurrection/catching away; nor will disbelieving that hoax make you ineligible to be caught up to meet Christ! Those who have the Resurrection Life (Jesus said: I AM the Resurrection!) dwelling in them will take part in that resurrection/catching away regardless of any eschatological prowess their part! It is the indwelling of the Spirit of Christ that will *quicken ALL those in which his Spirit dwells, and transform them (dead or living) into bodies that are identical to the body of our resurrected Savior! And on that day ALL believers of all ages will be caught up to meet Christ; because Christ who IS the Resurrection dwells inside them! *This also further highlights the bogus nature of pre-trib theory about the tribulation Saints we just discussed. Since the Bible clearly states in Matthew 24:29-31 that there WILL BE a resurrection at the Second Coming of Christ AFTER the tribulation (regardless of any supposed pre-trib rapture or not), and the pre-trib theory says the ‘tribulation Saints’ are not indwelt by the Spirit, they are saying those tribulation martyrs and survivors caught up to Christ after the tribulation are resurrected and transformed without the Resurrection Life dwelling in them. Give me a break! Do you really believe there is salvation outside of ‘Christ in you the hope of glory’? I sure hope you don’t! Brother Bobby, I thank you for the visit to the site, and for taking the time to comment, but you have a serious need to wake up and smell the deception! You have been taught many things that are absolutely not the true teachings of the Bible. The Pre-trib rapture doctrine is a provable hoax! I can show you that proof in a plain and easy-to-understand fashion. 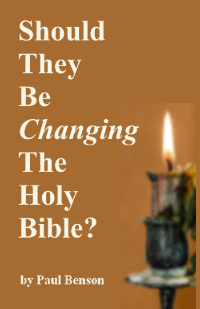 Please prayerfully read the free books and articles offered on this site. May the Lord have mercy, and lead us all into his perfect truth! Thank you, Paul. God bless you, brother. God Bless you, brother Keep on keepin’ on! Yes, the pre-trib theory is definitely an ear-tickler isn’t it? Thanks for sharing this look at the way that hoax perfectly fits the bill of Ezekiel’s description of the words of the deceivers. I always appreciate your perspective on things. The twisted pre-trib teaching has an undercurrent of thinly disguised anti-Semitism. As if we, the Church, are so special. After all, Jesus (last name) Christ taught in 1611 King James English (not!) . What a bunch of snobs acting like their sins are forgiven but the rest must suffer much to get saved. Yeshua (the) ha (anointed) Meshiach chose His disciples from the salt of the earth people. The teachable ones. Paul was highly educated, of course, but remember he had to be gobsmacked on the road to Damascus first before he could join the team.